Years of observance and practice in the Episcopal church’s tradition has made something of a “liturgical animal” of me. I find I am tuned in to the seasons of the Church year, and the rhythms of feast days and remembrances that are part of our practice. Some of these rhythms are anchored in our Celtic roots in early Britain, especially the observance in November of the turning of the season from the Harvest toward the winter solstice, on November 1 (known in Celtic tradition as Samhain). With the coming of Christianity this became the celebration of All Saints (including “All Hallows Eve” on October 31 and then All Souls the week after). The celebration of All Saints, that day of rejoicing with the whole company of heaven, was one of the practices that made an Episcopalian of me, back in my twenties. It puts on my internal calendar a celebration of the Resurrection hope, just as we turn the clocks back and the afternoons get really dark. It is a time to celebrate our connection to the Church Invisible, when the prayer for the day reminds us that we are “knit together” in one communion and fellowship, across the boundaries of life and death. This is part of our fundamental Baptismal identity. That is why the prayer book appoints All Saints Sunday as appropriate for Baptisms and the renewal of our Baptismal covenant. In one of the baptismal prayers we thankGod “for incorporating us into your holy Church and for making us worthy to share in the inheritance of the saints in light”. (BCP 311). The language may seem archaic but I’ve been sitting with that image of “the saints in light” particularly as late autumn comes to the mid-Atlantic region where I live. 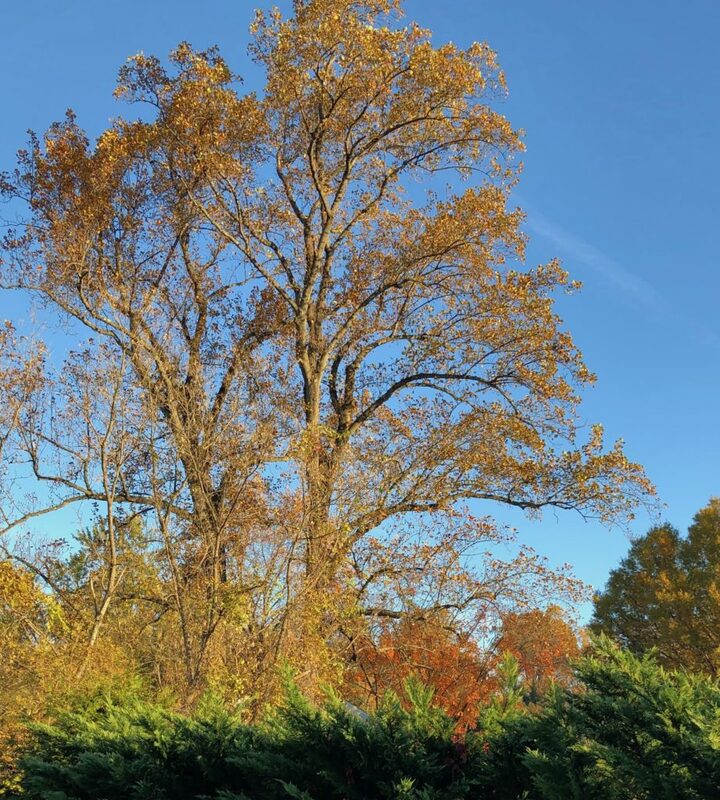 Though All Saints/Samhain emerged in Celtic lands in a season that was already bleak and bare of foliage, where I live now, in Maryland, early November is a time when the tulip trees turn gold and the maple trees orange. The light shining through these turning leaves has become for me something like the blossoms that sometimes show up in Eastertide: a sign of Resurrection hope in the midst of a dying season. November for me becomes a kind of“All-Saints-tide” that will carry me to the end of one church year and into the beginning of the next, as Advent approaches. Bodes chill and bracing autumn air today. Bright memories of the summer’s life transformed. Except their love remains and lives in me. As leaves of glory shine out of the dark.